Tricordant is a whole systems consultancy, working across all types of complex organisations, to enable them to be whole and healthy. This includes process design, strategy consultancy, change management and leadership development. The client wanted a new website that would incorporate many different elements including resources, blogs, newsletters, videos and other content. It was also vital that the new website’s visual appearance was consistent with the branding used across the rest of the business. This project involved working very closely with an expert designer to ensure that the website could seamlessly incorporate a wide range of different content elements in a consistent and user-friendly way. Because of the wide-ranging nature of Tricordant’s work, there was a lot of information to be included on the website, meaning a key challenge was to incorporate everything in an attractive layout with an intuitive navigation. This meant the project involved more work on designing information architecture and navigation than usual, but of course we rose to the task. Enabling users to find what they wanted quickly and easily was a key challenge, which we rose to with relish. The client had already written the copy, meaning we could test and evaluate different layouts to find the best way to present lots of different kinds of content in a consistent and attractive way. Of course, we kept in mind the existing corporate branding throughout the process, to ensure that the final result reflected and integrated with current company communications materials. 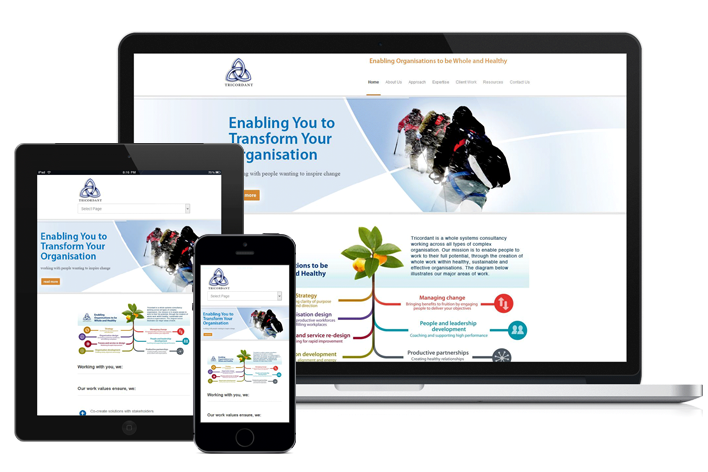 The resulting Tricordant website contains a great deal of information and content, but thanks to the simple and intuitive navigation, attractive page designs and clear visual style, the site is easy to navigate and use. To update the website themselves.